The MCX gold futures contract has risen sharply by 8.3 per cent over the last two weeks. A 6.3-per cent recovery in the global gold price over the last two weeks following the weaker dollar has supported MCX futures contract price. The short-term outlook for the MCX gold futures contract is positive. Support is available at Rs 29,500 and the contract can rise further to test Rs 31,500-31,700 levels in the coming weeks. Important short-term resistances to be watched are Rs 30,900 and Rs 31,697. For the medium-term, Rs 32,500 is a crucial resistance level. Failure to breach this resistance will keep the price pressured to test Rs 25,500-25,000. 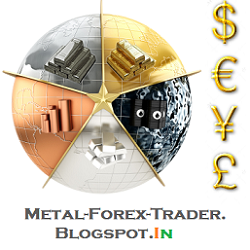 The MCX silver is now witnessing a corrective rally and has risen six per cent in the last two weeks. Significant short-term supports are available at Rs 48,500 and at Rs 47,500. Above these supports, the corrective rally can extend further in the coming week targeting Rs 51,000-51,500 levels. However, the medium-term outlook is bearish. Strong resistance is there in the broad Rs 52,000-53,000 region. The contract needs to breach the Rs 53,000 resistance decisively to turn the outlook bullish. Failure to break above Rs 53,000 will keep the medium-term bearish outlook intact for a fall to Rs 41,500-40,500 levels. 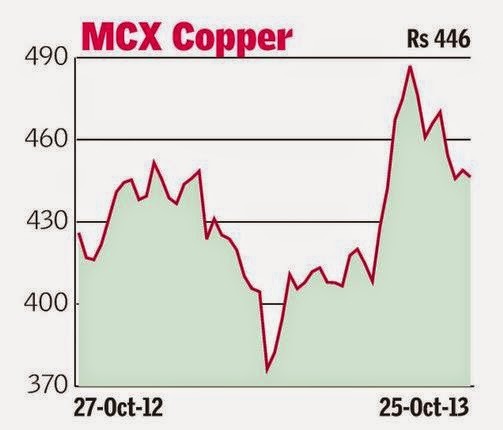 MCX copper futures contract is stuck in a sideways range between Rs 440 and Rs 460. The price can continue to consolidate in this range for some more time. Within this range, the bias is bearish. The contract can break and fall below Rs 440 towards Rs 430-425 in the short-term. The medium-term outlook is also bearish with strong resistance at Rs 470. While below this resistance, the contract can fall to Rs 400-390 in the medium-term. The MCX crude oil futures contract is in a strong downtrend now. The contract has closed 2.4 per cent lower for the week, its eighth consecutive lower weekly close. 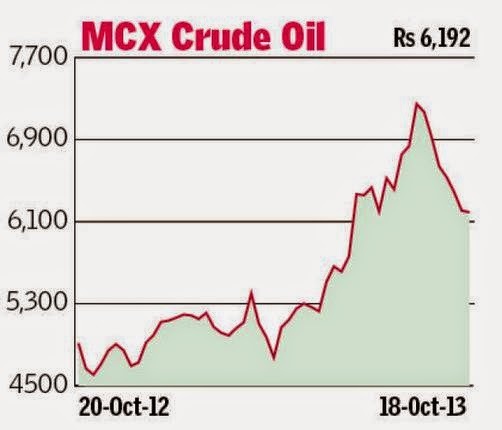 Sharp fall in the global crude oil price is keeping the MCX futures contract under pressure. Immediate resistance is at Rs 6,100 and then significant resistances are at Rs 6,200 and at Rs 6,300. While below Rs 6,300, the contract can fall to test Rs 5,855 and Rs 5,835. The medium-term outlook is also bearish and the contract can fall to Rs 5,500-5,400. Strong resistance is at Rs 6,600 which needs to be broken to reverse the current downtrend. 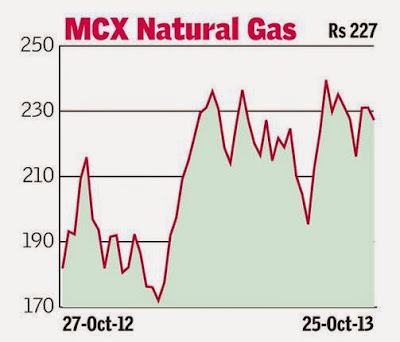 The MCX natural gas contract has been trading sideways between Rs 215 and Rs 240 in the last few weeks. A breakout on either side of Rs 215-240 will decide the trend, going forward. Below Rs 240, the trend is bearish and the contract may slide further to Rs 210 and Rs 205 in the short-term. However, the medium-term outlook is bullish. The contract is trading in a bull channel with strong support at Rs 200. A break below Rs 200 might not be very easy and the contract can rise higher to Rs 260-270 from this support level. A prolonged oversupply situation in global coal markets has led to Newcastle benchmark prices of the dry fuel crashing by 13.1 per cent to $81.45 a tonne in 2013. This is below their five-year average of $95.22/tonne. Prices are now expected to increase in the near-term as production cuts by key miners begin to take effect. 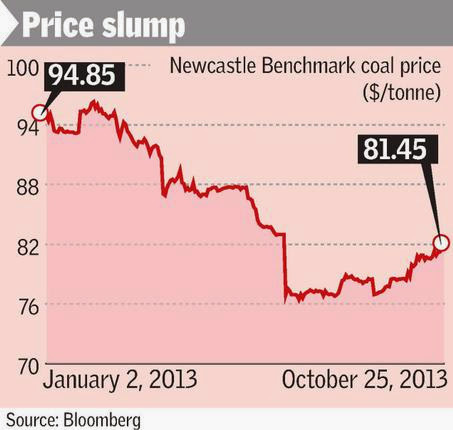 Newcastle coal prices, after hitting this year low of $76.45/tonne on July 10, have risen 6.5 per cent since then. Despite the increase, most producers lament that margins have been hurt by rising input costs, motivating them to slash output to constrict supply. Newcastle benchmark coal prices had peaked at $139.05/tonne on January 10, 2011, but are now down 41.4 per cent from that record level. Nevertheless, any upward movement in prices is likely to be limited. Coupled with concerns over slowing import demand from China, reduced imports by Indian buyers who have been keen to renegotiate contracts with key supplier Indonesia following a 17 per cent decline in the rupee during the year, continue to exert pressure on coal. Indonesian suppliers have been able to resist Indian consumers’ demands for better prices by selling their coal in the spot market. Regulation passed by the Indonesian government in 2011 forbids coal firms from exporting their produce at rates lower than international benchmarks, hurting a slew of Indian companies looking to source cheaper coal. Whether this strategy can be sustained hinges on a revival in demand. India accounts for a fifth of Indonesia’s coal exports, and the South-East Asian country recently trimmed its production estimates for the current calendar year to 390 million tonnes from 400 million tonnes. One major worry for global coal producers has been the shift toward cleaner fuel sources in China, the world’s largest importer. The Communist nation has been rapidly establishing hydro-power generation capacities, as well as gas-fired thermal plants, as it tries to mitigate high air pollution levels. But a greater concern for coal producers going forward could be a proposal to ban purchases of coal with a heating value below 4,540 kilocalories (kcal) a kilogram, sulphur content above one per cent and with ash content higher than 25 per cent. This could also result in increased supply. While other producers opted to go slow on their coal projects, Australian miners were ramping up output to take advantage of the fall in the Australian dollar versus the US dollar. While the cost of shipments from Newcastle fell by 13.3 per cent in US dollar terms this year, prices have only been eroded by 5.8 per cent in Australian dollar terms. This has helped boost Australian producers’ revenues and given them an incentive to increase supply. Australia is the world’s second-largest coal exporter. With Chinese import demand slowing down and the US shifting to cheaper shale gas, India has a better negotiating position in global coal markets. A good monsoon this year has enabled India to increase reliance on hydro sources for power generation. What is more, the economic slowdown is likely to hurt coal import volumes. A 4.7 per cent rise in Coal India’s production during the first half of 2013-14 will have a role to play in determining the exact quantum of imports. Coal India, prices its output lower than international benchmarks, viz, coal of 5,200 kcal/kg gross calorific value commands a rate of Rs 1,250/tonne ($20.42) in the case of power utilities, fertiliser units and the defence sector and Rs 1,690/tonne (27.60) for other industries. This is nearly three-fourth lower than international rates. According to the latest Commerce Ministry data, India imported 7.9 mt of coking coal for its steel and cement plants and 32.8 mt of steam coal that was used for thermal power generation purposes in the first quarter of 2013-14. The imports were valued at $3.8 billion. In 2012-13, the country’s coal imports were valued at $16 billion, of which coking coal constituted 35.6 mt and steam coal 106.7 mt. Lead, Zinc, Copper, Crude oil and Natural Gas. Technical Analysis MCX. Copper (Rs 448.8): Failing to breach the resistance at Rs 460, the MCX contract reversed lower from the intra-week high of Rs 459.8. The contract can consolidate sideways in the range between Rs 440 and Rs 460 for some time. Within this range the bias is to see a bearish break and fall below Rs 440. This will take the contract lower to Rs 430 in the short-term. The upside could be limited to Rs 470 if the contract breaks above Rs 460. The medium-term outlook is also bearish. There is a strong resistance between Rs 460-470 that needs to be broken to reverse the bearish outlook. Below Rs 470, the contract is likely to fall to Rs 400-390 in the medium-term. Crude oil (Rs 6,192): The intra-week bounce failed to breach the important resistance at Rs 6,300. The MCX crude oil has moved down from the high of Rs 6,348, to close lower for the seventh consecutive week. Below Rs 6,300, the short-term outlook is weak and it may test Rs 5,812 and Rs 5,855 levels which are the 200-day moving average and 61.8 per cent Fibonacci retracement support levels respectively. Even if the contract breaches the resistance at Rs 6,300, the upside will be limited to Rs 6,500. The medium-term view is also bearish. Strong resistance is seen in Rs 6,500-6,600 zone. Below this resistance zone a fall to Rs 5,500-5,400 is possible in the medium-term. Zinc (Rs 116.5): The MCX Zinc contract is consolidating sideways over the last few weeks. This sideways consolidation can continue for some more time and the price can remain in the Rs 113-120 range in the immediate short-term. Within this range, the bias is towards a bearish trend and the contract can break below Rs 113 in the coming days. The immediate downside target below Rs 113 is Rs 110. An eventual break below Rs 110 can take the price lower to Rs 104. For the medium-term, the contract has strong support near Rs 100. Above Rs 100, the medium-term outlook is bullish and the contract can trend upwards to test Rs 120-130 levels. Natural gas (Rs 231.1): As predicted in this column last week, the MCX Natural Gas contract tested the resistance at Rs 240. It fell and closed flat for the week. Failure to breach above Rs 240 implies that the bearish outlook is intact for the short-term. The contract can fall to Rs 220-210 in the coming weeks. However, the medium-term outlook is bullish as the contract remains in a bull channel. The channel support is near Rs 200 which can limit the downside. A fresh upmove from this support can take the price higher to Rs 260-270. Lead (Rs 132.2): The sharp fall from the August peak at Rs 155.4, is taking support near Rs 125 over the last couple of weeks. 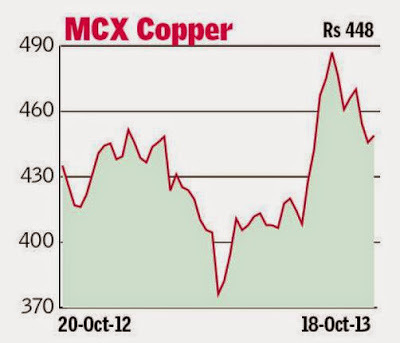 Above Rs 125, the MCX Lead contract can see a corrective rally towards Rs 140-143 in the short-term. However, a rise above Rs 143 might be difficult. On the other hand, if the price falls below Rs 125, the possibility of which is less at least in the immediate near term, then the contract can fall lower to Rs 120. The medium-term outlook is bullish. Strong support is at Rs 110-100 levels. The contract may test this support zone, but a fall below Rs 100 is less likely. The contract can take support at this level and move to Rs 160 in the medium-term. Nickel, an industrial metal, is mainly used to manufacture stainless steel. China leads the table in both production and consumption of refined nickel. In 2012, China contributed about 33 per cent of the total global production and consumed about 48 per cent of the consumption. India’s annual consumption of refined nickel is about 2 per cent on average of the total consumption. India depends entirely on imports to meet its demand. The futures contract price of Nickel traded on the London Metal Exchange has tumbled about 51 per cent since February 2011 because of increasing oversupply in the market. However, the situation may change in the coming year. Indonesia, the top exporter of nickel ore in the world, is planning a ban on the exports of its unprocessed ores from January 1, 2014. China imports 60 per cent from Indonesia. If this ban comes into effect as planned from January next year, then the current oversupply condition could take a big turnaround. This ban could be a big trigger in reversing the current downtrend in Nickel price and can take the price much higher in the next year. In this week’s dissector, we examine the outlook of the Nickel futures contract traded on India’s Multi-Commodity Exchange and in the LME. The MCX contract has closed for the week at Rs 869.3 and the LME contract at $14,160. The LME Nickel futures contract is in a strong downtrend since February 2011. But its price is nearing a crucial long-term trend support at $12,000 which could halt this downtrend. A bounce back from this support can take the price higher towards $20,000. On the other hand, if $12,000 gets broken, the contract can decline to test $9,000-8,000. The MCX Nickel contract witnessed a sharp fall from the high if Rs 2,253 recorded in April 2007 to a low of Rs 442.3 in December 2008. The corrective rally of this fall found resistance at Rs 1,327.8 in February 2011, just below the 50 per cent Fibonacci retracement resistance level of Rs 1,348 and the contract is coming down again since then. Failure to rise past the resistance at Rs 1,348 keeps the long-term downtrend intact for the MCX contract. Important support is at Rs 780, which if broken, can trigger a fresh fall. A rise from Rs 780 can be restricted to Rs 1,000 which is a strong technical as well a psychological resistance. While below Rs 1,000, the contract would remain vulnerable to break Rs 780 and fall to Rs 600-500 in the long-term. This fall to Rs 600-500 will be avoided only on a strong breach of Rs 1,000 that will open doors to target Rs 1,250-1,300 on the upside. The MCX contract is trading in a bear channel since November 2011. The channel support is near Rs 800. While above Rs 800, a rise to test the channel resistance at Rs 950 looks likely. The contract is expected to remain in this bear channel for some time. The strong fall from the August high of Rs 1,004 is finding support near Rs 840 over the last couple of weeks. The contract could now see a corrective rally to Rs 900 while it remains above Rs 840. If the resistance at Rs 900 is broken then the contract can rise further higher to Rs 920. Else, it can fall back to Rs 840 again. Candlesticks are usually composed of the body (black or white), an upper and a lower shadow (wick). The wick illustrates the highest and lowest traded prices of a stock, and the body the opening and closing trades. If the stock went up, the body is white, with the opening price at the bottom of the body and the closing price at the top. If the stock went down, the body is black, with the opening price at the top and the closing price at the bottom. A candlestick need not have either a body . History And Principles Of Technical Analysis Japanese Candlestick - Dow Theory Techniques. Definition of Candlestick And Bar Chart. The principles of technical analysis derive from the observation of financial markets over hundreds of years. The oldest known example of technical analysis was a method used by Japanese traders as early as the 18th century, which evolved into the use of Candlestick techniques, and is today a main charting tool. Dow Theory is based on the collected writings of Dow Jones co-founder and editor Charles Dow, and inspired the use and development of modern technical analysis from the end of the 19th century. Modern technical analysis considers Dow Theory its cornerstone. Many more technical tools and theories have been developed and enhanced in recent decades, with an increasing emphasis on computer-assisted techniques. A chart that displays the high, low, opening and closing prices for a security for a single day. The wide part of the candlestick is called the "real body" and tells investors whether the closing price was higher or lower than the opening price (black/red if the stock closed lower, white/green if the stock closed higher). The candlestick's shadows show the day's high and lows and how they compare to the open and close. A candlestick's shape varies based on the relationship between the day's high, low, opening and closing prices. A style of chart used by some technical analysts, on which, as illustrated below, the top of the vertical line indicates the highest price a security traded at during the day, and the bottom represents the lowest price. The closing price is displayed on the right side of the bar, and the opening price is shown on the left side of the bar. A single bar like the one below represents one day of trading.